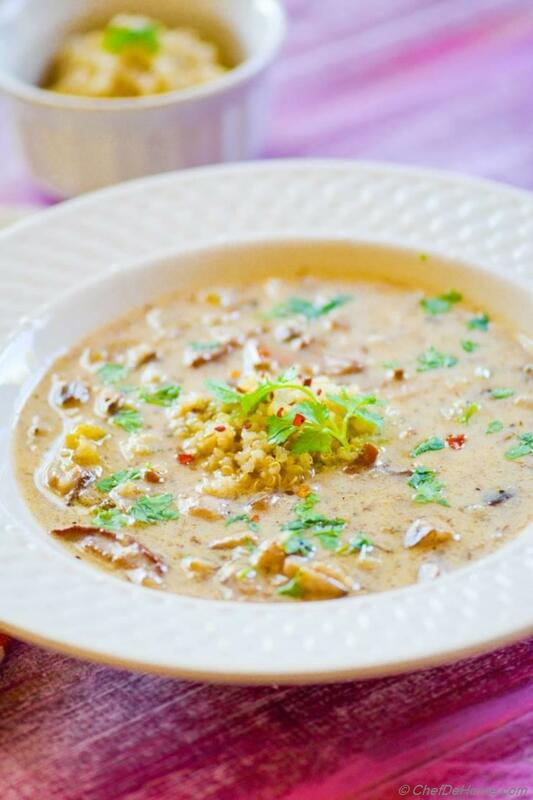 Sharing with you, fall favorite, warm, meaty without meat, no-fuss, creamy, and healthy bowl of mushroom soup. 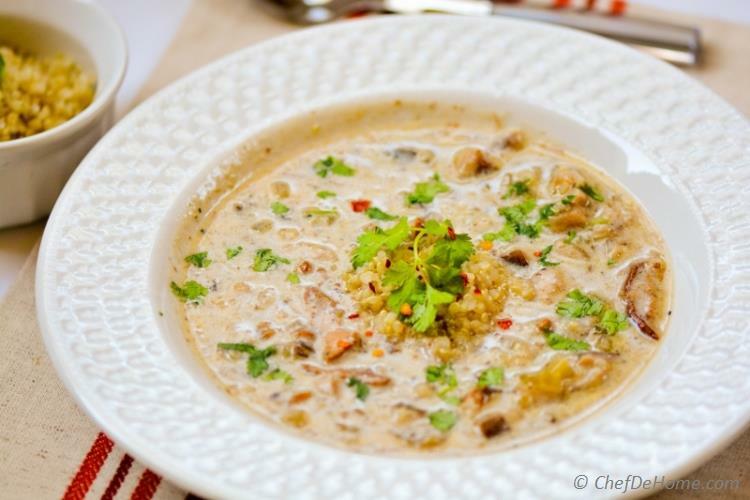 With a good serving of quinoa, wild golden chanterelle and shiitake mushrooms, this soup is comforting, healthy, and packed with flavor. 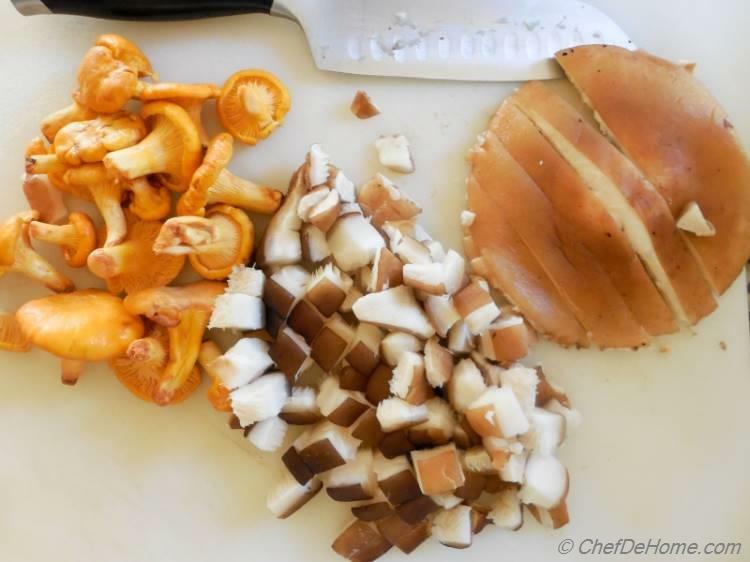 One of my favorite way to add a healthy dose of wild mushrooms in our diet during fall. 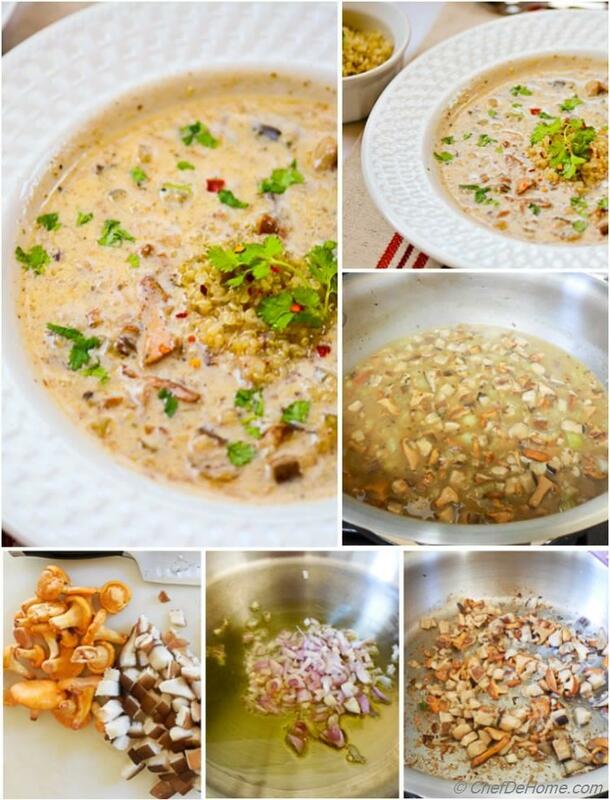 I have used wild golden chanterelle and shiitake mushrooms for this soup, you can use any combination you prefer. Sometimes, I add dried morels (or fresh if I can find some). This soup does not need a whole lot of mushrooms. For 4 servings, I have added 2 shiitake and just a handful of golden chanterelle. Chanterelle are pretty costly if you ask me. But I always buy chanterelle loose, never in a pre-packet. And choose small golden buds instead of big root-y ones, these weigh less, cost less, and have more flavor than roots. You can always bring some regular white button mushrooms to the party to make it more easy on packet. Once you bring home the mushrooms, rest is pretty much a-piece-of-cake. I don't call this a cream-of-mushroom-soup because it isn't. 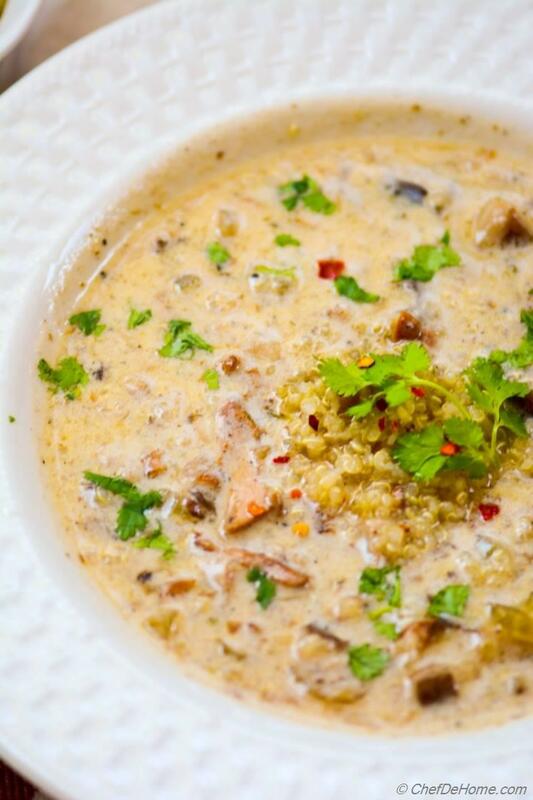 It is a chunky mushroom soup with just hint of fresh cream. So, no blender needed! It's just a cook-and-serve kind-of-soup. 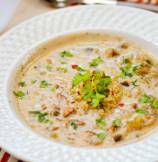 For vegan version, skip butter (or replace with more olive oil) and replace cream in the soup with plant-based-cream like coconut cream or cashew cream. Total Time 30 minutes Prep Time 5 minutes Cook Time 25 minutes Difficulty Easy Yields 4 Servings (4 cups) Serves 4 Notes 2 substantial or 4 side servings with bread. 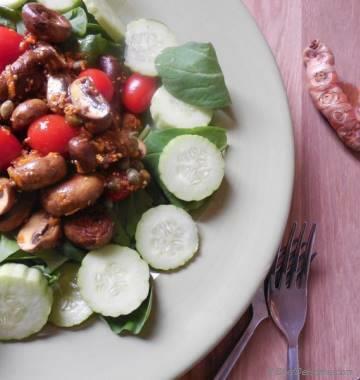 Smart Swap For vegan version, skip butter, replace heavy cream with plant-based coconut or cashew cream. 1. Heat butter and oil in a deep, heavy bottom, non-reactive (stainless steel) pan. 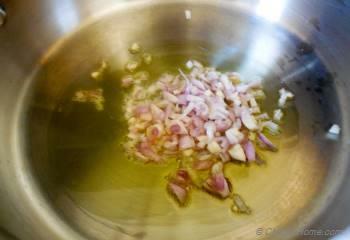 Add small diced shallots. 2. Saute until shallots are soft. 2 minutes. Also, add minced garlic mid-way in cooking. Stir as you don't want garlic to burn. 3. 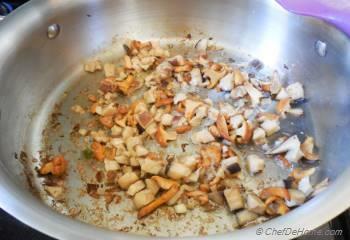 Add sliced mushrooms and continue saute until mushrooms have released all water and have started to caramelize a bit. 4. 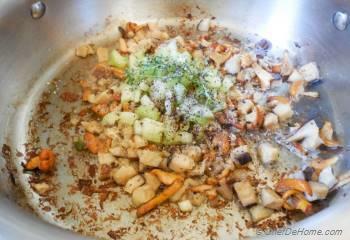 Add thyme, celery, salt and black pepper (add only if using low-sodium stock otherwise add salt/pepper at the end). 5. Saute for 2 more minutes until celery is soft and thyme has started to release it's perfume. 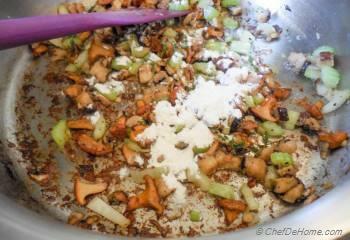 Now, add flour and mix coat the mushrooms, then continue cook for 2 minutes to cook-off the raw flour taste. Don't let flour burn. Don't worry about brown bits attached to bottom of the pan. We will release all shortly. 6. 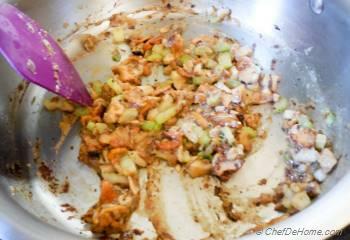 Add white wine and scrape the bottom of pan to release all brown bits. 8. 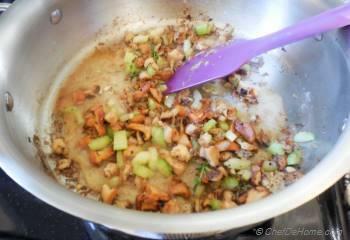 Now add vegetable stock plus 1 cup water, stir well to combine, bring mixture to a boil and then simmer for 10 minutes. 9. 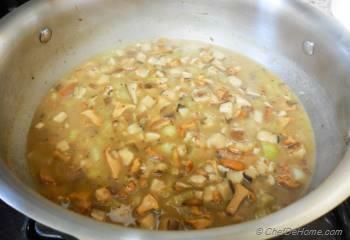 Simmer until soup has thickened and reduced to 3/4 of the original. 10. 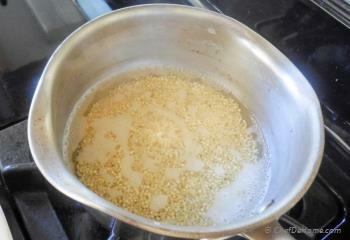 While soup is simmering, rinse quinoa under running water. Bring 2/3 of a cup water to rolling boil. Add qunioa and cook for 5 minutes. 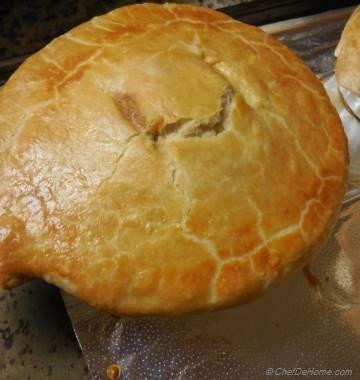 Remove from heat and let stand covered while soup finish cooking. 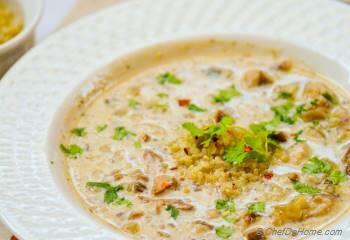 You can also add rinsed quinoa to cooking soup and cook quinoa in the soup. In this case, add 1/2 cup more water to soup. 11. 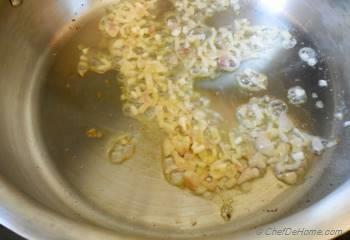 Once the soup is done reducing, add qunioa and heavy cream, stir to combine. Taste and adjust salt and black pepper. Serve garnished with some fresh cilantro or parsley leaves. Enjoy with a loaf of rustic bread on the side. If can't find fresh mushrooms, use dried. Rinse dried mushrooms under cold water to remove any dirt. 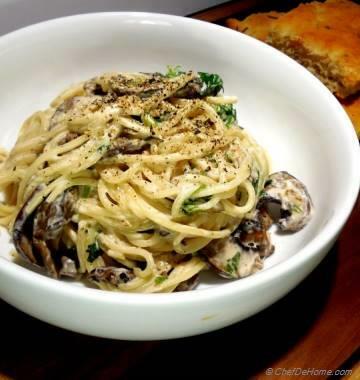 Soak mushrooms in warm water for 20 minutes before using. 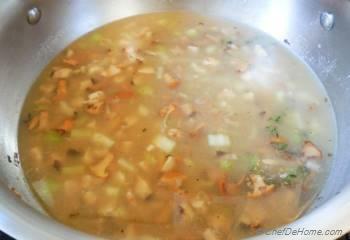 Also add the soaking liquid into the soup for additional flavor. thanks @ashwini, indeed, this mushroom soup was a hearty meal, specially during winters, just a bowl of this soul is enough to make an excellent dinner. Wow ... seems like a hearty meal.. yumm!! can't wait to try it!